Our programs are concise, elegant, and complete descriptions of algorithms. You can run the programs to study properties of the algorithms. You can put the algorithms immediately to good use in applications. Primitive data types and expressions. A Java program manipulates variables that are named with identifiers. Each variable is associated with a data type and stores one of the permissible data-type values. 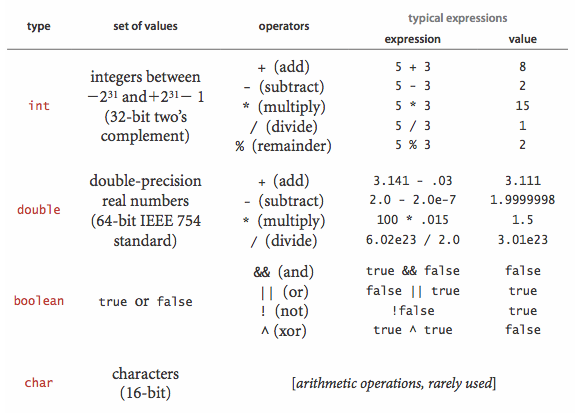 We use expressions to apply the operations associated with each type. 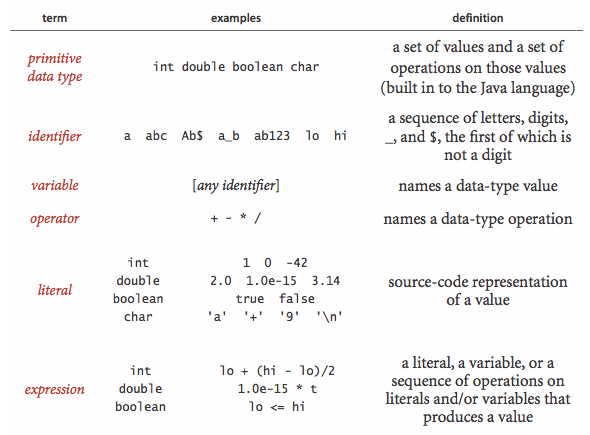 The following table summarizes the set of values and most common operations on those values for Java's int, double, boolean, and char data types. Expressions. Typical expressions are infix. When an expression contains more than one operator, the precedence order specifies the order in which they are applied: The operators * and / (and %) have higher precedence than (are applied before) the + and - operators; among logical operators, ! is the highest precedence, followed by && and and then ||. Generally, operators of the same precedence are left associative (applied left to right). You can use parentheses to override these rules. Type conversion. Numbers are automatically promoted to a more inclusive type if no information is lost.For example, in the expression 1 + 2.5, the 1 is promoted to the double value 1.0 and the expression evaluates to the double value 3.5. A cast is a directive to convert a value of one type into a value of another type. For example (int) 3.7 is 3. Casting a double to an int truncates toward zero. A Java program is composed of statements, which define the computation by creating and manipulating variables, assigning data-type values to them, and controlling the flow of execution of such operations. Declarations create variables of a specified type and name them with identifiers. Java is a strongly typed language because the Java compiler checks for consistency. The scope of a variable is the part of the program where it is defined. Assignments associate a data-type value (defined by an expression) with a variable. 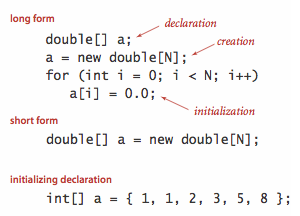 Initializing declarations combine a declaration with an assignment to initialize a variable at the same time it is declared. Increment/decrement operators: the code i++ is shorthand for i = i + 1. The code ++i is the same except that the expression value is taken after the increment/decrement, not before. Other compound operators: the code i /= 2 is shorthand for i = i/2. Conditionals provide for a simple change in the flow of execution—execute the statements in one of two blocks, depending on a specified condition. Loops provide for a more profound change in the flow of execution—execute the statements in a block as long as a given condition is true. We refer to the statements in the block in a loop as the body of the loop. For notation. Many loops follow this scheme: initialize an index variable to some value and then use a while loop to test a loop continuation condition involving the index variable, where the last statement in the while loop increments the index variable. You can express such loops compactly with Java's for notation. Single-statement blocks. 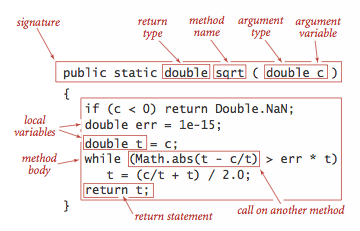 If a block of statements in a conditional or a loop has only a single statement, the curly braces may be omitted. The following table illustrates different kinds of Java statements. An array stores a sequence of values that are all of the same type. If we have N values, we can use the notation a[i] to refer to the ith value for any value of i from 0 to N-1. Declare the array name and type. Default array initialization. For economy in code, we often take advantage of Java's default array initialization convention and combine all three steps into a single statement. The default initial value is zero for numeric types and false for type boolean. Initializing declaration. We can specify the initialization values at compile time, by listing literal values between curly braces, separated by commas. Using an array. 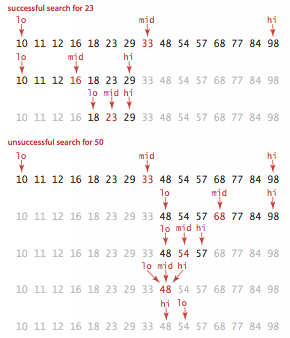 Once we create an array, its size is fixed. A program can refer to the length of an array a with the code a.length. Java does automatic bounds checking—if you access an array with an illegal index your program will terminate with an ArrayIndexOutOfBoundsException. Aliasing. An array name refers to the whole array—if we assign one array name to another, then both refer to the same array, as illustrated in the following code fragment. b[i] = 5678;   // a[i] is now 5678. This situation is known as aliasing and can lead to subtle bugs. Two-dimensional arrays. A two-dimensional array in Java is an array of one-dimensional arrays. A two-dimensional array may be ragged (its arrays may all be of differing lengths), but we most often work with (for appropriate parameters M and N) M-by-N two-dimensional arrays. To refer to the entry in row i and column j of a two-dimensional array a, we use the notation a[i][j]. Static methods are called functions in many programming languages, since they can behave like mathematical functions. Each static method is a sequence of statements that are executed, one after the other, when the static method is called. Defining a static method. 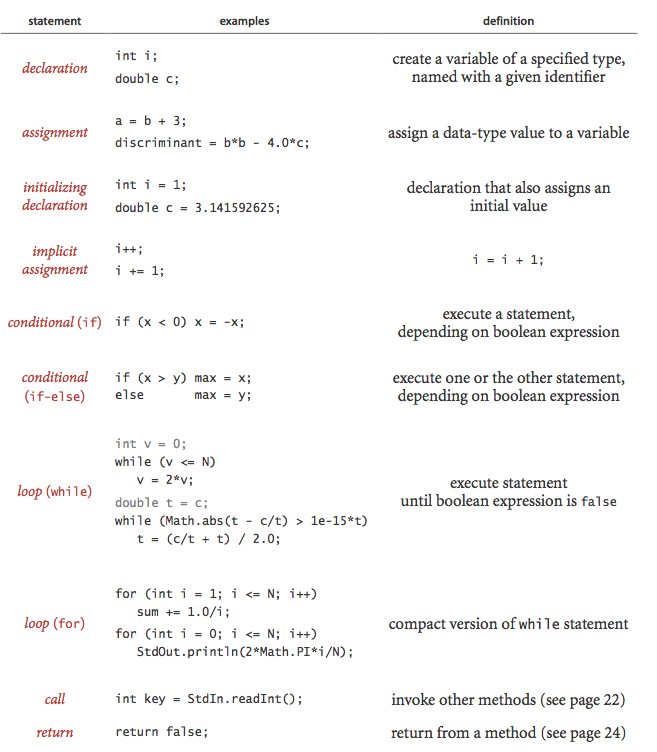 A method encapsulates a computation that is defined as a sequence of statements. A method takes arguments (values of given data types) and computes a return value of some data type or causes a side effect. Each static method is composed of a signature and a body. Invoking a static method. A call on a static method is its name followed by expressions that specify argument values in parentheses, separated by commas. When a method is called, its argument variables are initialized with the values of the corresponding expressions in the call. A return statement terminates a static method, returning control to the caller. If the static method is to compute a value, that value must be specified in a return statement. Arguments are passed by value. When calling a function, the argument value is fully evaluated and the resulting value is copied into argument variable. This is known as pass by value. Array (and other object) references are also passed by value: the method cannot change the reference, but it can change the entries in the array (or value of the object). Method names can be overloaded. Methods within a class can have the same name, provided they have different signatures. This features is known as overloading. A method has a single return value but may have multiple return statements. A Java method can provide only one return value. Control goes back to the calling program as soon as the first return statement is reached. A method can have side effects. A method may use the keyword void as its return type, to indicate that it has no return value and produces side effects (consume input, produce output, change entries in an array, or otherwise change the state of the system). The recursion has a base case. Recursive calls must address subproblems that are smaller in some sense, so that recursive calls converge to the base case. Recursive calls should not address subproblems that overlap. Basic programming model. A library of static methods is a set of static methods that are defined in a Java class. A basic model for Java programming is to develop a program that addresses a specific computational task by creating a library of static methods, one of which is named main(). Modular programming. Libraries of static methods enable modular programming, where static methods in one library can call static methods defined in other libraries. This approach has many important advantages. Unit testing. A best practice in Java programming is to include a main() in every library of static methods that tests the methods in the library. External libraries. We use static methods from four different kinds of libraries, each requiring (slightly) differing procedures for code reuse. Standard system libraries in java.lang, including java.lang.Math, java.lang.Integer, and java.lang.Double. Imported system libraries such as java.util.Arrays. An import statement at the beginning of the program is needed to use such libraries. Other libraries in this book. To use such a program, download the source from the booksite into your working directory or follow these instructions for adding algs4.jar to your classpath. The standard libraries that we have developed for use in this book. To use such a program, download the source from the booksite into your working directory or follow these instructions for adding stdlib.jar to your classpath. To invoke a method from another library, we prepend the library name to the method name for each call: Math.sqrt(), Arrays.sort(), BinarySearch.rank(), and StdIn.readInt(). Input and output from a file. Below is a complete Java program BinarySearch.java that illustrates many of the basic features of our programming model. It implement a classic algorithm known as binary search and tests it for an application known as whitelist filtering. The static method rank() takes an integer key and a sorted array of int values as arguments and returns the index of the key if it is present in the array, -1 otherwise. It accomplishes this task by maintaining variables lo and hi such that the key is in a[lo..hi] if it is in the array, then entering into a loop that tests the middle entry in the interval (at index mid). If the key is equal to a[mid], the return value is mid; otherwise the method cuts the interval size about in half, looking at the left half if the key is less than a[mid] and at the right half if the key is greater than a[mid]. The process terminates when the key is found or the interval is empty. Whitelisting. For testing, we use the sample files tinyW.txt, tinyT.txt, largeW.txt, and largeT.txt. Here is a list of the input and output libraries that we use throughout the textbook and beyond. We briefly describe the input and output libraries and include a sample client. StdIn.java and StdOut.java are libraries for reading in numbers and text from standard input and printing out numbers and text to standard output. Our versions have a simpler interface than the corresponding Java ones (and provide a few technical improvements). RandomSeq.java generates random numbers in a given range. 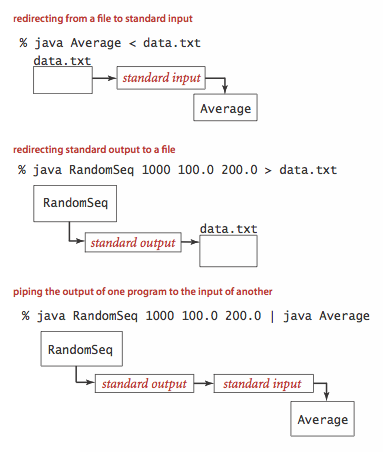 Average.java reads in a sequence of real numbers from standard input and prints their average on standard output. In.java and Out.java are object-oriented versions that support multiple input and output streams, including reading from a file or URL and writing to a file. StdDraw.java is an easy-to-use library for drawing geometric shapes, such as points, lines, and circles. 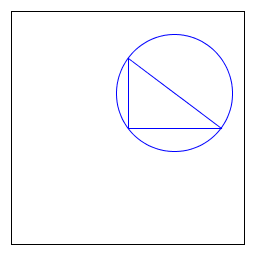 RightTriangle.java draws a right triangle and a circumscribing circle. Draw.java is an object-oriented versions that support drawing in multiple windows. StdAudio.java is an easy-to-use library for synthesizing sound. Tone.java reads in a frequency and duration from the command line, and it sonifies a sine wave of the given frequency for the given duration. 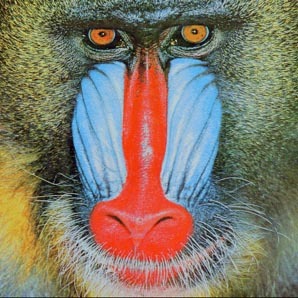 Picture.java is an easy-to-use library for image processing. Scale.java takes the name of a picture file and two integers (width w and height h) as command-line arguments and scales the image to w-by-h.
Q. How important is it to use a good shuffling algorithm? A. Here's an amusing anecdote of what happens when you don't do it correctly (and you're business is online poker!). If you're running an online casino, here's the recommended approach for shuffling a deck of cards: (i) get a cryptographically secure pseudo-random number generator, (ii) assign a random 64-bit number to each card, (iii) sort the cards according to their number. Binomial distribution. Estimate the number of recursive calls that would be used by the method call binomial1(100, 50, .25) in Binomial.java. Develop a better implementation that is based on saving computed values in an array. Sattolo's algorithm. 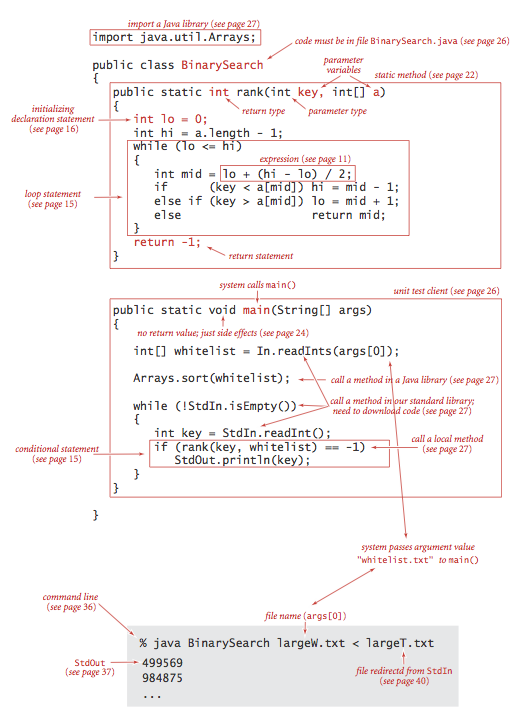 Write a program Sattolo.java that generates a unifomly distributed cycle of length N using Sattolo's algorithm. Wget. Write a program Wget.java that reads in data from the URL specified on the command line and saves it in a file with the same name. Right triangle. Write a client RightTriangle.java that draws a right triangle and a circumscribing circle. Bouncing ball. Write a program BouncingBall.java that illustrates the motion of a bouncing ball. Last modified on June 17, 2018.